Almost 60 per cent of people consider how a company operates and performs in matters relating to the environment, social issues and governance when buying financial services, according to a new research by Ethex, the leading social and environmental impact investment platform and its sister platform, Energise Africa. However, just 17% of respondents say they hold ethical investments. Positive or ethical investing allows people to put their money into opportunities that provide environmental, social and governance benefits, such as social enterprises, community housing or renewable energy schemes. Ethical investment products can range from cash savings accounts, bonds and equity investments, and allow customers to direct their money into specific locations and types of impact which match with their own personal values and motivations. 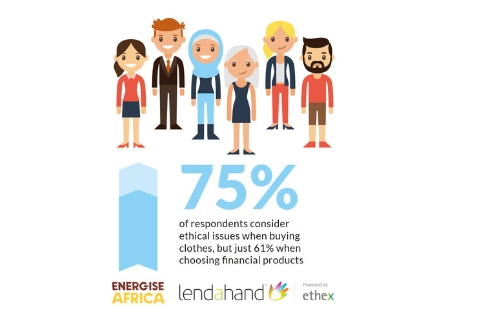 Ethex and Energise Africa surveyed more than 2,000 people and found that ethical considerations impact the decisions of 1,187 respondents (58%) when they shop for financial services. Of these, 51% were women and 49% were men. Of those that said ethical considerations are absolutely critical to their choice when purchasing financial services, 41% were 18-34 years old – nearly double those aged 55+ (23%). This trend reflects the growing number of socially and environmentally conscious millennials who are driving the UK’s market for ethical products and services and can be seen in the number of those that hold entirely ethical investments. Almost half (49%) belong to Generation Y, while just 15% are 55+. However, despite budding ethical considerations from younger customers, interest in ethical products remains low. Just 17% of those surveyed have any ethical investments. The poll reveals a strong call for greater awareness. Nearly four in five (78%) respondents say more education and information would motivate them to become more involved in investing in ethical products, while 86% say easily accessible financial products are important. Lisa Ashford, CEO, Ethex and Energise Africa, said: “It is interesting to see that three in five people take ethical considerations into account when purchasing financial services. However, this enthusiasm does not necessarily convert into actual people investing. The sector needs to better serve this growing interest by providing more education and information to give people the confidence to invest in ethical products. Empowering people in this way will help to protect people and the planet as well as generate potential financial returns. “Ethex and Energise Africa enable everyday people to invest directly in social enterprises and mission driven businesses that are tackling some of society’s biggest challenges, including climate change, and supporting the achievement of the UN Sustainable Development Goals. Individuals can invest from as little as £50 in shares, bonds, funds and ISAs, and Ethex and Energise Africa provide a direct and personal way for people to invest in businesses they believe in.